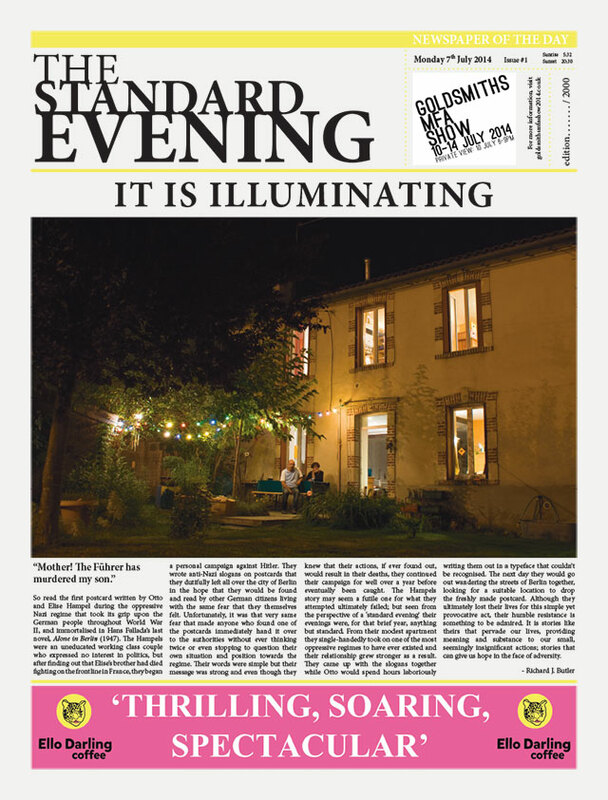 Taking the form of a tabloid newspaper, The Standard Evening is a collective artwork that aims to provoke a debate about disposable, free newspapers. What are our expectations when opening a newspaper? How do we react to the news in general? And what do we really get from it? This first issue includes contributions by international artists, curators and writers. 2,000 copies will be distributed and stacked up alongside the ‘authentic’ evening newspapers in significant tube and train stations in London on Monday 7th July 2014, ready to be picked by travellers on their daily commute. Some of them might be surprised when discovering the content of what they thought was their ever yday read. Ian Whittlesea, Marie Fontecave, Richard J. Butler, Paulina Michnowska, Nikolai Ishchuk, Gareth Owen Lloyd, Stephanie Moran, FOSB Clinic, Gisa Pantel, Iben Elmstrom, Emma McCormick-Goodhart, Andreas Scholz, Peckham Pictures, Brendan M. Pickett, Ting-Ting Cheng, Matthew Verdon, Adelle Stripe, Louise Chignac, Grace Wilson, Nicole Bachmann, Julia Gorostidi, Declan Jenkins, Demelza Watts, Abri de Swardt, Persilia Caton, Sandra Oviedo, Antonio Garcia Acosta, Isil Egrikavuk, Julia Marchand.